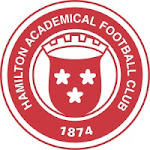 This blog is about Hamilton Academical Football Club - the Accies. We all have our diversions. Everyone likes a holiday, but the long close season seems to drag for many fans, even in the likes of this, the most eventful of close seasons. Last season was almost extended by the events at the end, with the under-19s winning the league cup at the end of May, Cadzow winning the supporters' cup, and the Accies women playing on through June. 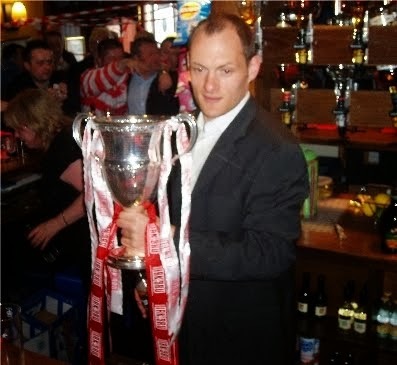 Alex Neil was unsurprisingly confirmed as the new Accies manager, following his articulate explanation of the problems of the player/manager role, at the end-of-season fans' forum. No dissenting voices, as far as I know, and everyone is eagerly awaiting how "Sir Alex" rises to the challenge of a full season in the hot seat. The recent announcement that Jon Routledge has renewed his contract may be seen as one endorsement. And there's always football being played somewhere, with the James boys winning the FA Cup with Wigan, and the Confederations Cup reaching its climax this weekend. Then there were the off-field problems of Dunfermline and Hearts, neither resolved so far. And the league re-structuring saga, which seems finally to have been resolved on terms favourable to Accies, with Les Gray joining the Board of the new body. Heart of Midlothian have become the tenth senior Scottish football club to experience an insolvency event since the turn of the century. This is significant when you have to be in your 50s, at least, to remember the last such event in the 20th century, Third Lanark, in 1967. Since 2000, the roll-call reads: Morton, Clydebank, Airdrieonians, Motherwell, Dundee (twice), Livingston (twice), Gretna, Rangers, Dunfermline, and now Hearts – or almost a quarter of senior Scottish clubs. Anyone who thinks our game isn’t in crisis isn’t paying attention. Two of those clubs are no longer senior clubs, but at least they still exist at some level, unlike Third Lanark, who disappeared completely. Could the same thing happen to Hearts? Hearts are believed to owe £25 million to their former Lithuanian owners - £15 million to their bankers, Ukio Bankas, and £10 million to their parent company, UBIG (Ukio Bankas Investment Group). The actual total debt could be much more, even before taking accout of other liabilities, as both these entities are no longer trading, and their administrators/liquidators will play a key role in the future of Hearts. The timing of this is especially difficult for the Hearts administrator, as close season is a period when there is little income. The administrator has said they need to sell 3000 season tickets in the next two weeks, just to meet immediate commitments, and redundancies have begun for both players and other staff. One of the problems is Hearts no longer own Tynecastle – Ukio Bankas hold it as security for their debt. Another is their players have little re-sale value, although it is the small hope of player sales that has prevented them all being made redundant already. It looks like it will be hard for Hearts to attract a buyer and achieve a Creditors Voluntary Agreement, both of which they need within a few weeks, if they are to continue in the SPL. It looks a distinct possibility that they will be liquidated, and according to precedents expelled from the SPL, raising the questions of whether a new incarnation of the club could be admitted to the ranks of senior Scottish football, and if so at what level? It is also a distinct possibility that they have played their last game at Tynecastle. The knock-on effect of the loss of the second biggest travelling support in the SPL may impact further on other clubs, especially those already in financial difficulties, such as Kilmarnock, Aberdeen and Dundee United. For second tier clubs such as Accies, it opens up further opportunities for access to the top flight. If Hearts drop out, Morton may find themselves in next year’s SPL. From next season, 2nd to 4th in the second tier will have play-offs with the 11th place club in the SPL, but at the current rate, there could be another vacancy every season. This is not to indulge in schadenfreude at the expense of other clubs’ misfortunes, but to acknowledge that many of the old certainties no longer apply. With incomes falling, no league sponsor, and uncertainty over the terms of the SKY TV deal, it is unlikely we have seen the last insolvency, and few (if any) clubs have a secure future. If ever there was a time for a combination of financial prudence and marketing innovation, this is it. The SFA have announced the 12 teams that will make up the new Lowland League as part of creating a pyramid system allowing new teams into the the Scottish Professional Football League (SPFL) and also teams to be relegated from there to the Highland or Lowland Leagues. The following link leads to a BBC article detailing the successful teams. Interestingly despite active canvassing by the SFA, no junior teams applied for a slot and there is a suggestion that they are going to create their own super/super league consisting of the best junior teams from the east and west. It suggests to me the junior teams are quite comfortable with their business model. The one team in the Lowland League that intrigues me is East Kilbride. This is an amalgamation of a number of amateur teams in the town and has nothing to do with EK Thistle, the junior team or the recently renamed EK Clyde and I would have thought this puts paid to EK Clyde's move to the new town. The EK team that has won a place in the Lowland League is backed by a local builder who has land and apparently is keen to build a stadium. All he lacked was a team. So if EK are successful over the next few years and gain a place in the lower reaches of the SPFL presumably they will be playing in a brand new stadium which leaves EK Clyde groundless so to speak! Looking ahead if there is a senior team in EK, I wonder what this might do to Hamilton's already low attendance figures. If the Clyde experience is anything to go by gathering support from a new town base is not quite as simple as might be thought. Without a team, individuals have no doubt been attracted to the Old Firm and it can take a long time to break such habit if it can ever be broken. Whatever no one can say that scottish football isn't going to be interesting over the next few years as teams come and indeed go! There are two main reasons why Scotland needs to switch to summer football - one is strategic, the other tactical. Scottish football is in severe decline, measured by almost any indicator you choose, and over a long period of time. The performances and results of the national team, the performances and results of the clubs representing us in European competition, the development and exporting of young talent, the financial health of our clubs, and many other factors, all bear testament to decades of decline. The players of today may be fitter, more athletic, more tactical aware, and perhaps even have greater technique, but who doesn't yearn for the ball skills of a Jim Baxter, a Jimmy Johnstone, or even a Kenny Dalglish or Graeme Souness? To say nothing of the successes of the 60s, 70s and 80s. The key to breaking this spiral of decline is to attract more young talent into the sport - the more good players we have, at every level, the greater our chances of developing the top players we need. Winter football is one of the main barriers to attracting and retaining that talent. Young people today don't have the opportunities to play and learn skills in street football, and new facilities have not been built fast enough. But it's the rain, the sleet, the wind, the cold and the mud that deters the new generations. And why? Other than the fact that it's always been that way, I haven't heard any argument for playing the game in the least clement weather conditions. It's not as if Scotland has a popular alternative summer sport. We all know fans enjoy attending in better weather, the game looks better (other than to thrawn aficionados of the muddy slide tackle), and most importantly, the conditions are right to practise and repeat ball skills. Playing in the summer is not just desirable, but essential to encouraging more players, identifying and promoting the best players, and giving them the conditions to improve their skills. That's the strategic reason. The tactical reason is that, for the moment at least, none of the bigger leagues in Europe (Spain, Italy, France, Germany and England) plays in the summer. That creates a gap in the TV schedules, and a chance to secure prime time slots and higher payments, boosting the finances of the game. Scotland could steal a march on these competitor leagues by acting swiftly and decisively. Or it may already be too late, with yesterday's Guardian reporting that Rupert Murdoch may be set to fund summer contests among some of the world's leading clubs - none of which is likely to come from Scotland. The football community, not least its administrators, is notoriously cautious, conservative, and wary of innovation. On this issue, such a characteristic may be the barrier to progress. Summer football is not some sort of quirky eccentric idea - it is the natural solution to one of the biggest problems in the game. It needs to be implemented as a matter of urgency. This guest blog is contributed by Colette Carr. Glasgow City maintained their 100% league record as five goals separated them and Hamilton Accies Women at Petershill Park. The high scoreline did not reflect the game however as Accies contained the league leaders throughout and keeper Megan Cunningham proved outstanding in ability, their efforts not going unnoticed by manager Kevin Murphy. Murphy commented: “I thought we done great today.” He continued: “The application and work rate I thought was a different class from the team, I thought they worked so hard together as a team, and individually I thought they were great. “Going into the second half at one nil down we’re in with a chance, granted we never had much of the ball or created a lot of opportunities, but you’re always going to come away to places like Glasgow City and face that, but when the scoreline is at one nil you’re kind of hopeful, and I just felt that when the second goal went in it killed the game a little, the players were getting a bit tired, legs heavier, we just had a bad ten minutes there, tired at the end and conceded. “I think five nil is harsh for the girls, yes City had a lot of possession but I thought we worked so hard and our efforts deserved better than what they got today.” The hosts started brightly, pressuring Accies, as Ruesha Littlejohn sent her shot wide just moments into the match. Eilish McSorley then sent a long ball up towards Jo Love for City, but Hamilton’s Chloe Quinn was quick to intercept and cleared it away to safety. City were then at it again, Love combining with former Accies star Sarah Crilly to setup Littlejohn in the box, however, Cunningham dived at the Irish internationalist’s feet shielding the ball. Just after the 20th minute, Crilly sent a lethal low cross into the goal mouth after losing Carolina Richardson, but Cunningham proved her bravery again, coming out to hold it. Eight minutes later, Crilly netted the first of the match for Glasgow, her twisting volley flying into the top far corner. Cunningham and Littlejohn found themselves in a one on one again, Cunningham coming out and colliding with Littlejohn heavily, however the referee waved play on. Accies new signing Gillian Sloey saw yellow after 34 minutes, seemingly for repetitive fouling, and a free kick was given about twenty five yards out on the left. After Leanne Ross’ delivery, Littlejohn’s lob flew over the goal. Two minutes before time, the Hamilton backline did well to delay Suzanne Lappin’s efforts, but Cunningham pulled out another top drawer save when the City midfielder got her strike in. Five minutes into the second period, Littlejohn hit the post with her short free kick before she found goal, but Glasgow’s second was chalked off due to a handball. Moments shy of the hour Suzanne Malone rattled off the cross bar from very close range for the home side. Accies then found a glimpse of City’s goal, with Cara McBrearty belting the ball deep into the hosts half, before Sloey headed over. Despite high pressure inside the area from City, Hamilton were doing well to keep the score at one nil, and keep the hosts at bay. The next seven minutes of the match however would prove to be Hamilton’s undoing, the 75th minute seeing Lappin whipping her shot into Cunningham’s goal, three minutes later Littlejohn coolly slotting from wide, the 81st seeing Lappin picking up the end of a corner to head in and Lappin completing her hat-trick a minute later with another strong header. A moment before time Cunningham displayed another superb save to deny Love from 25 yards, topping off a great day for the keeper despite the scoreline. While Glasgow City go away with their 100% record still intact, Accies will be disappointed to miss out on a spot in the top six before the break, and to concede five goals in what was a strong solid defensive display from the Lanarkshire side. This is a tough away fixture to the recent League Cup winners and current leaders of the Scottish Women's Premier League. Accies bloggers will be there to cheer on the women - why not join us? 1. Who we are. This blog is written by Accies fans, for Accies fans. Anyone is free to read and to contribute, including fans of other teams, as long as they abide by these rules. 2. What we stand for. We support Accies, the team and the club, and this blog is a vehicle to express that support, and further the interests of the club, and the first team in particular. Criticism is welcome, as long as it is constructive; abuse is not. 3. Support for youth development. We support the football development of young people and children at all levels at Accies, and welcome contributions on how these efforts may be advanced. 4. Support for Accies women. We support the efforts of HAWFC, Hamilton Accies Women's and Girls' Football Club, and encourage the involvement of women and girls in football. 5. Support for supporters. We support the efforts of The Hamilton Academical Supporters' Society (the Accies Trust), and all groups who help and represent supporters. 6. Family-friendly. All of the content of this blog is intended to be suitable for a family audience, including children, and we ask everyone to bear this in mind when commenting. If this blog was a movie it would have a U certificate. 7. Open and honest. All of the contributors to, and administrators of this blog are genuine Accies fans, identified by their real names, and we ask everyone who comments to use their real names too. There is no editorial policy, beyond these rules, and all opinions expressed are the open and honest opinions of the named contributors. 8. No offensive language. Swearing, abuse, and any language of hatred will not be tolerated. No comments of this kind will be published. 9. Respect for other users. We ask that all comments show respect to all contributors, acknowledging that they contribute in good faith. Disagreement is fine; abuse is not. 10. Feedback. We welcome feedback of all kinds. If you wish to write blog contributions, have any ideas for further content, or any other comments, including complaints, please contact one of the administrators.